The Italian invasion of Albania (April 7 – April 12, 1939) was a brief military campaign by the Kingdom of Italy against the Albanian Kingdom. The conflict was a result of the imperialist policies of Italian dictator Benito Mussolini. Albania was rapidly overrun, its ruler, King Zog I, forced into exile, and the country made part of the Italian Empire as a separate kingdom in personal union with the Italian crown. Albania had long been of considerable strategic importance to the Kingdom of Italy. Italian naval strategists coveted the port of Vlorë and the island of Sazan at the entrance to the Bay of Vlorë, as they would give Italy control of the entrance to the Adriatic Sea. In addition, Albania could provide Italy with a beachhead in the Balkans. Before World War I Italy and Austria-Hungary had been instrumental in the creation of an independent Albanian state. At the outbreak of the war, Italy had seized the chance to occupy the southern half of Albania, to avoid it being captured by the Austro-Hungarians. That success did not last long, as Albanian resistance during the subsequent Vlora War and post-war domestic problems forced Italy to pull out in 1920. The desire to compensate for this embarrassing failure would be one of Mussolini's major motives in invading Albania. When Mussolini took power in Italy he turned with renewed interest to Albania. Italy began penetration of Albania's economy in 1925, when Albania agreed to allow Italy to exploit its mineral resources. That was followed by the First Treaty of Tirana in 1926 and the Second Treaty of Tirana in 1927, whereby Italy and Albania entered into a defensive alliance. 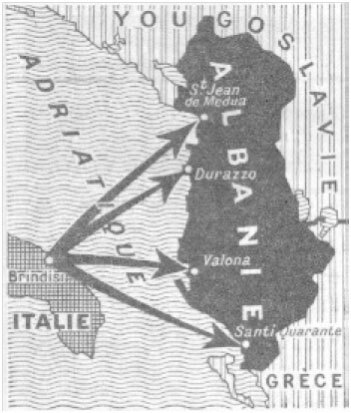 The Albanian government and economy were subsidised by Italian loans, the Albanian army was trained by Italian military instructors, and Italian colonial settlement was encouraged. Despite strong Italian influence, King Zog I refused to give in completely to Italian pressure. In 1931 he stood up openly to the Italians, refusing to renew the 1926 Treaty of Tirana. After Albania signed trade agreements with Yugoslavia and Greece in 1934, Mussolini made a failed attempt to intimidate the Albanians by sending a fleet of warships to Albania. As Nazi Germany annexed Austria and moved against Czechoslovakia, Italy saw itself becoming the lesser member of the Pact of Steel. The imminent birth of an Albanian royal child meanwhile threatened to give Zog a lasting dynasty. After Hitler invaded Czechoslovakia (March 15, 1939) without notifying Mussolini in advance, the Italian dictator decided to proceed with his own annexation of Albania. Italy's King Victor Emmanuel III criticized the plan to take Albania as an unnecessary risk. Rome, however, delivered Tirana an ultimatum on March 25, 1939, demanding that it consent to Italy's occupation of Albania. Zog refused to accept money in exchange for allowing a full Italian takeover and colonization of Albania. The Albanian government tried to keep secret the news of the Italian ultimatum. While Radio Tirana persistently broadcast that nothing was happening, people became suspicious; and the news of the Italian ultimatum was spread from unofficial sources. On April 5 the king's son was born and the news was announced by cannons. People poured out into the streets alarmed, but the news of the newborn prince calmed them. People were suspicious that something else was going on, which led to an anti-Italian demonstration in Tirana the same day. On 6 April there were several demonstrations in Albania's main cities. That same afternoon 100 Italian aircraft flew over Tirana, Durrës, and Vlorë, dropping leaflets instructing the people to submit to Italian occupation. The people were infuriated by this demonstration of force and called for the government to resist and to release the Albanians arrested as "communists". The crowd shouted, "Give us arms! We are being sold out! We are being betrayed!". While a mobilization of the reserves was called, many high-ranking officers left the country. Also the government was fading away. The Minister of the Interior, Musa Juka, left the country for Yugoslavia the same day. While King Zog broadcast to the nation that he would resist Italian occupation, people felt that they were being abandoned by their government. On the other side the regular Albanian army had 15,000 poorly equipped troops who had been trained by Italian officers. King Zog's plan was to mount a resistance in the mountains, leaving the ports and main cities undefended; but Italian agents placed in Albania as military instructors sabotaged this plan. The Albanians discovered that artillery pieces had been disabled and there was no ammunition. As a consequence, the main resistance was offered by gendarmes and small groups of patriots. In Durrës, a force of only 360 Albanians, mostly gendarmes and townspeople, led by Abaz Kupi, the commander of the gendarmerie in Durrës, and Mujo Ulqinaku, a marine official, tried to halt the Italian advance. Equipped only with small arms and three machine guns, they succeeded in keeping the Italians at bay for several hours until a large number of small tanks were unloaded from the Italian ships. After that, resistance began to crumble, and within five hours Italy had captured the city. By 1:30 pm on the first day, all Albanian ports were in Italian hands. That same day King Zog, his wife, Queen Geraldine Apponyi, and their infant son Leka fled to Greece, taking with them part of the gold reserves of the Albanian Central Bank. On hearing the news, an angry mob attacked the prisons, liberated the prisoners and sacked the King's residence. At 9:30 am on April 8, Italian troops entered Tirana and quickly captured all government buildings. Italian columns of soldiers then marched to Shkodër, Fier and Elbasan. Shkodër surrendered in the evening after 12 hours of fighting. However, two officers garrisoned at Rozafa castle refused to obey the ceasefire order and continued to fight until they ran out of ammunition. The Italian troops later paid homage to the Albanian troops in Shkodër who had halted their advance for an entire day. During the Italian advance in Shkodër the mob besieged the prison and liberated some 200 prisoners. The number of casualties in these battles is disputed. The Italian military forces maintained that at Durrës 25 Italians were killed and 97 wounded and 160 Albanians were killed and several hundred wounded, while the townspeople of Durrës declared that some 400 Italians had been killed. To cover up their losses the Italians immediately took away the bodies and washed the harbor and streets of Durrës. On April 12, the Albanian parliament voted to depose Zog and unite the nation with Italy "in personal union" by offering the Albanian crown to Victor Emmanuel III. The parliament elected Albania's largest landowner, Shefqet Vërlaci, as Prime Minister. Vërlaci served as interim head of state for five days until Victor Emmanuel III formally accepted the Albanian crown in a ceremony at the Quirinale palace in Rome. Victor Emmanuel III appointed Francesco Jacomoni di San Savino, a former ambassador to Albania, to represent him in Albania as "Lieutenant-General of the King" (effectively aviceroy). On April 15, 1939, Albania withdrew from the League of Nations, from which Italy had resigned in 1937. On June 3, 1939, the Albanian foreign ministry was merged into the Italian foreign ministry, and the Albanian Foreign Minister, Xhemil Dino, was given the rank of an Italian ambassador. Upon the capture of Albania, Italian dictator Benito Mussolini declared the official creation of the Italian Empire and the figurehead King Victor Emmanuel III was crowned King of the Albanians in addition to his title of Emperor of Ethiopia, which had been occupied three years before. The Albanian military was placed under Italian command and formally merged into the Italian Army in 1940. Additionally, the Italian Blackshirts formed four legions of Albanian Militia, initially recruited from Italian colonists living in Albania, but later from ethnic Albanians. Albania followed Italy into war with Britain and France on June 10, 1940. Albania served as the base for the Italian invasion of Greece in October 1940, and Albanian troops participated in the Greek campaign, but they massively deserted the front line. The country's southern areas (including the cities of Gjirokastër and Korçë) were temporarily occupied by the Greek army during that campaign, but Italy, regardless of the fact of not even winning one battle against the Greek Army, eventually was given charge of Albania, due to Germany's assistance with its Greek campaign and the subsequent occupation of Greece by the German Army. Albania was enlarged in May 1941 by the annexation of Kosovo and parts of Montenegro and the Vardar Banovina, going a long way towards realizing nationalistic claims for a "Greater Albania". Part of the western coast of Epirus called Chameria was also annexed, and put under an Albanian High Commissioner, who exercised nominal control over it. When Italy left the Axis in September 1943, German troops immediately occupied Albania after a short campaign, with relatively strong resistance. During the Second World War, the Albanian Partisans, including some sporadic Albanian nationalist groups, fought against the Italians (after autumn 1942) and, subsequently, the Germans. By October 1944 the Germans had withdrawn from the southern Balkans in response to military defeats by the Red Army, the collapse of Romania and the imminent fall of Bulgaria. After the Germans left due to the rapid advance of Albanian Communist forces, the Albanian Partisans crushed nationalist resistance and the leader of the Albanian Communist Party, Enver Hoxha, became the leader of the country. Albania: A Country Study: Albania's Reemergence after World War I, Library of Congress. Albania: A Country Study: The Communist and Nationalist Resistance – Library of Congress.